Learn about the updates to levels, goals, and reporting below, or log in to Cerego to experience them yourself. Based on data science and user feedback, we found that our current level system excelled at providing motivation and metrics for long-term learning, but it wasn’t helping people get over the initial hump of learning and engaging with new content. 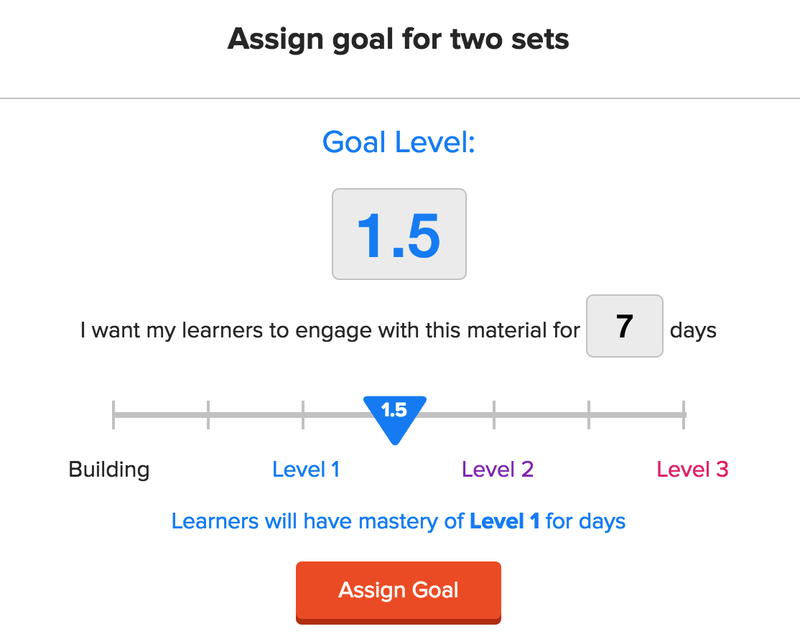 With two new levels before Level 1, it’s now super simple for learners to track their early-stage progress and stay motivated. The first time you study an item, the memory gets moved into the “New” level. This lets you know that you’ve completed the first review for that item. The next time the same item is reviewed, and you are able to successfully demonstrate knowledge of the item, it moves to “Building.” This is an important step in the learning process, as it marks the first time a memory is successfully recalled at a later stage in time. All items, or memories, start out as ‘New’ (there is no skipping ahead), but with a few successful reviews, learners will move ahead. Because learning is front-loaded (meaning, a large portion of activity occurs in the early period), newer memories need more practice, so learners should plan on daily review for the first week or two. With the addition of “New” and “Building” levels, we hope learners get right amount of encouragement and feedback on their progress - especially in the beginning! Starting today, all sets and series have a new metric, aptly named “Set Level”. On Cerego, a set is defined as a group of related content, analogous to a chapter in a textbook. While the ideal set contains items of roughly the same difficulty, it’s common for learners to excel in one area and not another because some concepts are more difficult for them than others. Also, because individual memories are typically distributed across levels it can be difficult to judge how well a learner knows the subject as a whole. That is where Set Levels come in. The Set Level is the average of all studied items in that set, and lets learners know where they stand across everything they are learning in a given set. The Set Level feature is our way of keeping learners on track using consistent, visual feedback. Goal setting just got better. As Set Levels measure real-time progress, goals keep learners engaged in learning and on track so that they can achieve better outcomes. Goals can be adjusted to fit the needs of your specific course, which means Cerego can be used in any situation, for any type of content, whether you’re seeking to build lifelong skills or mastering this week’s lesson. If you’re an instructor, we recommend assigning a memory goal to all of your sets. Goal Level 1.5 is the recommendation for a default level goal, and is achievable in about one week of distributed practice, but you can adjust goals as you see fit. With this update, Cerego can now suggest a goal based on how long you expect learners to spend on the material. You can then adjust the goal to better meet the unique needs of your particular students. If you’re a learner, you’ll see your assigned goals and Set Level in the Memory Bank. Finally, we’ve combined three of our existing reports into one robust report: the “Set Progress Report”. Leveraging (you guessed it) Set Level data and assigned goals, this new report is both simpler and more powerful. The Set Progress Report is the simplest and most effective report for using Cerego as a graded component in the classroom. If you have assigned a set goal (recommended), the students ‘progress to goal’ percentage is an easy score to convert to a grade. You can see your precise goal next to the learner’s Set Level, and the grade we’ll be sending back. In just a click you can get the data you need, and use it to help learners get more out of their time spent in the classroom. We’re excited about the updates, and hope you are too. Let us know what you love, or what you would change via the support tab at the bottom of our website. 07.08.17 PanelPicker Community Voting for SXSW EDU Programming Is Open: VOTE for Cerego! 15.06.17 The Public Library is Closed, But We’re Still Open!